An excellent reproduction of the "402" oil pan used on all 1966-69 B-Body big block and 1970-71 B & E-Body 383 applications. Produced from heavy gauge steel with correct internal baffles as original. E-coated to prevent corrosion and to promote paint adhesion. Includes #5890 drain plug. 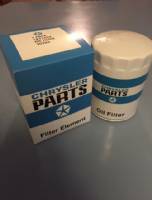 Reference Chrysler part #2532 401. Chrome Oil Dip-Stick & Tube A-Engine 273, 318, 340 & 360. Chrome Oil Dip-Stick & Tube for B/RB Engine 361, 383, 400, 440, 413, and 426 Hemi. Oil Dipstick for B/RB Motors. Small Block Oil Filter Flange Bolt & Gasket Set. This Bolt & Gasket Pkg is Used to Mount the 90 Degree Oil Filter Adapter to Small Block V8 Engines. the Bolt is Stronger Than the Original to Provide Better Sealing Capabilities.